Regan O’Neill and William H. Buisch proudly announce the appointment of William P. Buisch as V.P. and C.O.O. 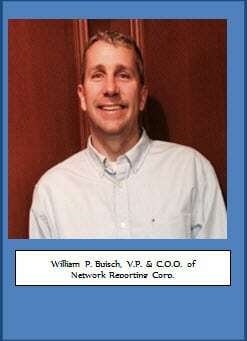 of Network Reporting Corporation, Michigan’s largest statewide court reporting firm. Network’s new Chief Operating Officer brings to the company a unique combination of educational and business qualifications. Plus, he virtually grew up with Network Reporting. Bill, now 44, is the oldest son of one of the co-founders and has clear memories of, “sitting at our dinner table over 30 years ago, listening to my Dad talk about how fast Network Reporting was growing.” Young Bill continued saying, “I remember cleaning the bathrooms and emptying the trash in their first office on Beech St., in downtown Cadillac.” Bill earned a BS Degree in Plastics Engineering from Ferris State University and an MBA from the University of Phoenix. He began his career in the field of plastics manufacturing and later worked as a Product Design Engineer in Detroit’s auto industry. From 2006 to 2014, after a career in manufacturing, Bill successfully opened six Little Caesar’s franchises in Indianapolis. Bill and his wife Paula then returned to their shared hometown of Cadillac with their three children, Billy, Kayla and Cooper. By hiring excellent managers and having long distance management skills, Bill is able to maintain the ownership of his restaurants. From age 12, Bill has had a front row seat to watch Network’s evolution from a struggling mid-Michigan startup to what has now become one of Michigan’s most sophisticated and experienced freelance court reporting companies. No longer bordered by the Great Lakes, Network Reporting can schedule a deposition, for any law firm anywhere in the world! He saw Network become the first, and now the most experienced, in tele-video depositions, tele-video conferencing, and producing same-day trial transcripts.